Among their many uses, portable partitions can be used to help shelter people in the greatest time of need. Homeless shelters use partitions at night for sleeping and take down to use the same room for meals during the day. In the early 1990’s, church administrators sought to find better, faster, easier ways to make Sunday school classrooms in their open multipurpose rooms. They found the answer in a new line of portable room dividers. These partitions are versatile, easy to use, sound absorbing and can be rolled anywhere needed on ball bearing, self-leveling casters. While these are great for Sunday school, the uses for this unique line of products has expanded beyond its original intent. Churches are known for hosting PADS shelters within their facility. Dozens of homeless men, women, and children move from church to church to seek shelter. PADS shelters need privacy areas to separate each different group of people. Room dividers allow the staff to create these private areas for the PADS guests. 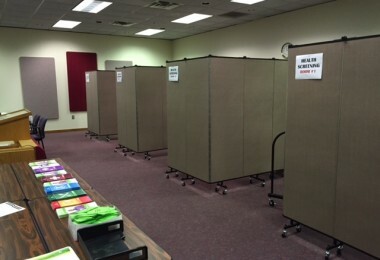 The dividers are then used to separate Sunday School Classrooms by age groups on the weekends. In addition, we all know unfortunate natural disasters can strike any part of our country at any time. Each year many homes are destroyed by tornadoes, hurricanes, floods, fires and occasionally an earthquake. Often those displaced families find shelter with close relatives or friends, but sometimes they can’t. Thankfully, local churches and schools open their doors to these people until a more permanent solution is found. Once again, the room dividers can be arranged to create private areas. In these situations, the number and gender of people staying at the church can change daily. This is where the versatility of portable room dividers becomes invaluable. Depending on the size of the area needed each night, the dividers can be easily moved to create the exact size rooms that are needed. The room sizes can be made larger or smaller as needed depending on if there are more people coming or going to and from the church during their stay. During the day the dividers can be easily folded and rolled to another part of the church where they are expanded once again to create separate areas for child care programs or other important ministries. One of the most important features of room dividers for church administrators is their stability. Stability comes from the combination of having most of the weight in the end frame close to the floor so it is not top heavy, and by having end frames which are from 27 to 29.5 inches wide. End frames which are narrower don’t provide the stability desired in popular heights/lengths and wider end frames become cumbersome.